It is a translation of the French piqué (sharp, as in “piquant”), participle of piquer. Piccata is an Italian word, the feminine form of the word piccato, meaning “larded”. It is also spelled picatta or pichotta. It is a translation of the French piqué, participle of piquer. When used in reference to a way of preparing food, particularly meat or fish, it means “sliced, sautéed, and served in a sauce containing lemon, butter and spices”. Traditionally, the Italians use veal (veal piccata), however the best known dish of this sort in the US uses chicken (chicken piccata). The recipe has a meatless adaptation using seitan (seitan piccata). 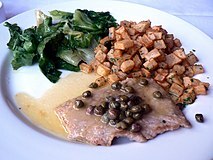 Piccata is also prepared using veal (piccata di vitello al limone) or frittura piccata, particularly in the Milanese region  swordfish (pesce spada con capperi e limone). However, the best known dish of this sort in the US uses chicken (chicken piccata). A chicken breast is butterflied or sliced along its width. It is flattened to an even thickness with a tenderizer between two pieces of wax paper or plastic wrap. It is seasoned and dredged in flour before being browned in butter or olive oil. The sauce is made using the pan drippings. Lemon juice and white wine or chicken stock are added and reduced. Shallots or garlic can be added with capers, chopped parsley and slices of lemon. After reduction, butter is stirred in to finish the sauce. In the United States, it is usually served with a vegetable or a starch, such as pasta, polenta, or rice. In Italy, veal piccata is a secondo and would be served after the pasta (or other starch) course. ^ Del Conte, Anna (2013). Gastronomy of Italy: Revised Edition. ISBN 1862056587. ^ Zibart, Eve (2010). The Ethnic Food Lover's Companion: A Sourcebook for Understanding the Cuisines of the World. ISBN 0897323726. 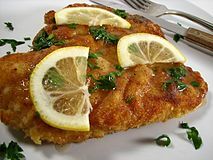 ^ "Ricetta Piccata di vitello al limone - RicetteMania". www.RicetteMania.it. Retrieved 16 January 2018. ^ "Pesce spada con capperi e limone". Academia Barilla - l’arte della gastronomia italiana. Retrieved 16 January 2018. 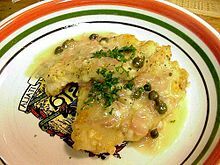 ^ "Quick And Simple Chicken Piccata". Perdue.com. Retrieved 31 October 2017.